A major concept change at an all-favourite restaurant is always a gamble. But trust AD Singh to recast a space loved by the capital for 15 years, with both, restaurant and the patrons emerging as winners. The trusted bar at Olive Bar & Kitchen, Delhi — Dirty Martini — recently made way for Serai, a culinary cocktail bar. 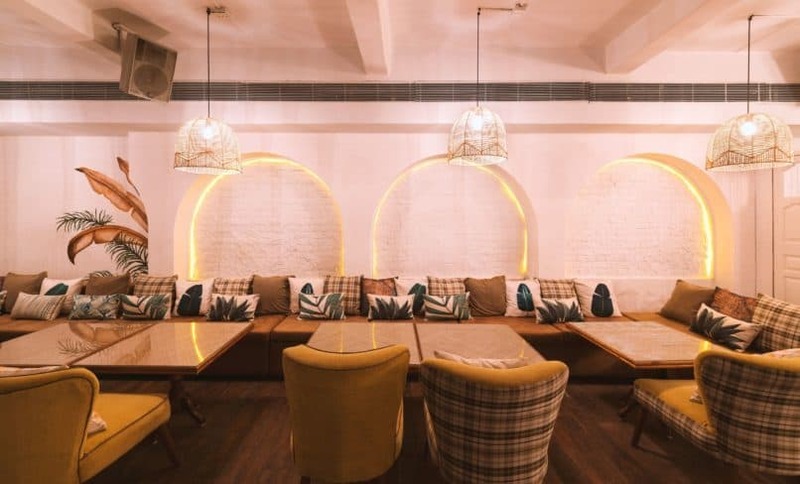 A spanking new space within one of Delhi’s most loved and frequented restaurants, Serai seeks to blend the trendy with tradition, both in its food & drinks and character. In the same section where Dirty Martini stood, first step in and an imposing travel theme greets you. 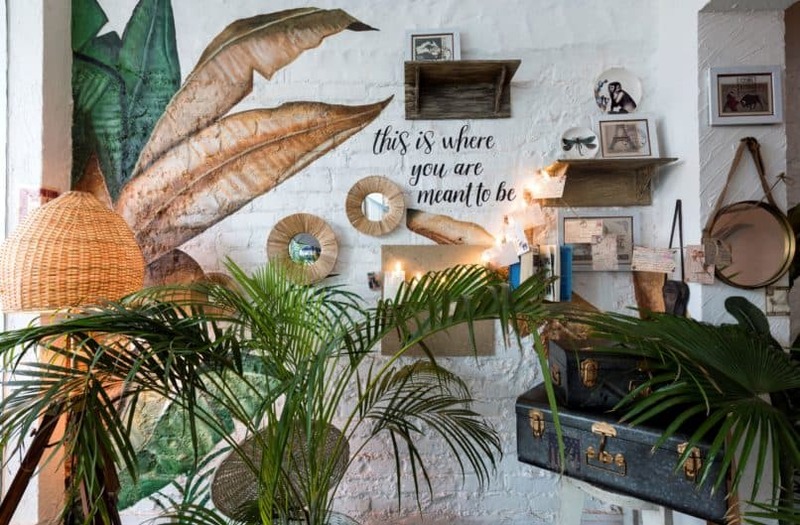 Clean white walls contrasted by real and painted-on palms leaves, trunks, yellowed letters and postcards, and cane furnishings make for the perfect Instagram-friendly spot. The easy seating follows the famous Japanese Wabi-Sabi aesthetics, which accepts and finds beauty in imperfection. The tree in the smoking area and the terrace overlooking lush greens remain unchanged, yet add to the allure of travel that’s been created. Apart from the classic cocktails, the menu has dedicated sections for culinary cocktails and tequila tonics. Carrying forward their signature personal touch, the culinary cocktails are inspired from the Olive team’s travels, and promise to take one from Spain to Greece to Burma all in the span of one evening. Each of comes with a pinxto on the side — a typical Spanish bite-sized snack to go with your drink, and a thoughtful addition if one doesn’t wish to order a whole dish on the side. The Sangria Sour is a great mix of the bitter alcohol flavours juxtaposed with sweet fruity notes. Wine and vodka come infused with red and green apples, strawberries, and topped off with rose dust. The strong flavours of whiskey and egg are balanced out by the rose and lime, making for a smooth medley of tastes. It is paired with an all-olive toastie. The Spanish olive bread with olive marmalade and olive bubble on top is done craftily so it doesn’t get overwhelming, and is a delight for those who love the fruit. The Kumquat & Chilli inspired by Greece has a base of tequila mixed with a marmalade made of kumquat and chilli. The sour kumquat and spicy chilli make for a tart drink, with the strong tequila adding to it. It comes with a barley & dried fig rusk fig jam, hazelnut, and feta puree, its sweet and nutty elements complementing the stiff drink well. The Turmeric Old Fashioned, from India itself, leans heavily on the bitter flavours with its raw turmeric, whiskey, and yuzu bitters. Accompanied by a crunchy & flaky papdi pop, with toppings of goat curd and date and gongura chutney, the two are a testament to traditional Indian flavours. The Hibiscus Teq-Tonic made for a lighter, sweet concoction, with the freshness of the ingredients hitting you like Spring wind. Their small plates section continues the theme of world-inspired preparations. The Angle Burger is an indulgent treat. A triangular burger with a tiger prawn patty, bacon, and pork skin. The meats are crackling and tender till the centre, a must have for those who enjoy a well-made non-vegetarian burger. 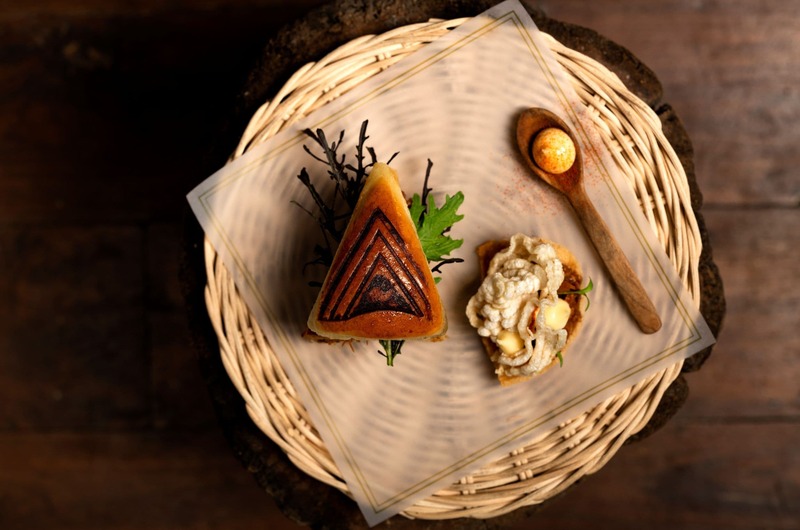 The Beijing Duck is homemade sourdough flatbread topped with plum-glazed duck leg. The rich duck is contrasted by cilli, spring onions, and walnuts, adding texture to the dish. The Chilli & Mole is an international take on the typical chilli pakoda, and comes with machengo cheese mousse to amp up the dish. 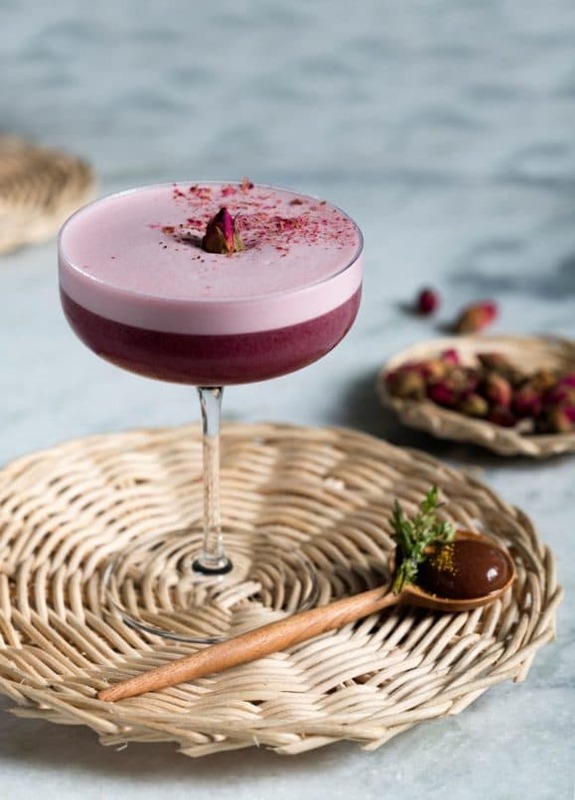 Thought behind the menu, fresh ingredients, in-house shrubs, Serai is a product that has been curated keenly. Keeping the millennials in mind, yet not letting go of their veteran guests, there’s something for everyone here. Whether it is stiff drinks had over a lengthy sit down conversation, or fun tipples over a DJ night or nibbles and a glass enjoyed over live music, the bar seeks to beings together friends, family, and strangers who become so.